[ Samuel March Phillipps, legal writer and civil servant. ] Three Letters in a secretarial hand, all signed by him ('S M Phillipps'), to Seymour Teulon, regarding his attempts to present an 'Address of the Borough of Southwark' at a levee. All three from Whitehall. 18 and 22 July 1837, and 10 February 1838. The three items in good condition, on lightly-aged paper. The first two, both on black-bordered paper, are each 1p., 4to; the third is 1p., folio. In the three letters Teulon's address is given as Dean Street, Southwark. The first two appear to be in Phillipps's hand, but the matter is uncertain. Phillipps writes on behalf of the Home Secretary Lord John Russell, to whom he acted as private secretary. [ Francis Ingram-Seymour-Conway, 2nd Marquess of Hertford. ] 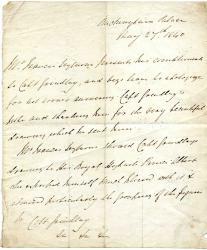 Autograph Letter Signed ('Hertford') to Sir Robert Bateson Harvey, requesting his political support. Suffolk, 29 October [ 1806 ]. 1p., 4to. On bifolium. In good condtion, lightly aged. Addressed, with part of red wax seal, on reverse of second leaf, to 'Sir Robert Bateson Harvey Bt | Langley Park'. He is 'perfectly aware' of his 'having not the smallest pretention to apply' to Harvey, but is encouraged 'by the friendly support which you gave to Mr Macnaughten at the general election in the county of Antrim to beg a continuance of your support and assistance on the present occasion'. Previously represented Lisburn and Antrim in the 1770s. See Wikipedia for details of his political career (not revealing about 1806 though). [ Lord William Seymour, son of the 8th Duke of Somerset. ] Autograph Letter Signed ('Willm Seymour') and Autograph Letter in the third person, both to 'Mr. Pitman', linen draper of Devizes, regarding two works of natural history. Both from Seend [ Wiltshire ]. 24 May and 11 August 1788. The two items in fair condition, with light signs of age and wear, and both laid down on part of a page from an album. ONE: 24 May 1788. 1p., landscape 12mo. Written in the third person: 'Lord William Seymour Presents his Compliments to Mr. Pitman Will be much Obliged to him for the lent [sic] of His Curtis's Flora Londinensis. Ld. Wwm will take great Care of them -'. TWO: 11 August 1788. 1p., landscape 12mo. Addressed on reverse to: 'Mr Pitman | Linnen [sic] Draper | Devizes'. He is obliged to him 'for a Sight of Barbut's English Fossils. [ John Seymour Lucas, RA. ] Four Autograph Letters Signed (all 'Seymour Lucas') to 'Mr Slocombe' [ the artist Shirley Slocombe ], written in a light-heared and affectionate tone. All on letterhead of New Place, Woodchurch Road, West Hampstead. 1902 (2), 1904 and 1908. The four letters all in good condition, on lightly aged and worn paper. ONE: 22 July 1902. 2pp., 12mo. Rearranging a meeting, following his absence 'at my cottage in Norfolk'. TWO: 6 August 1902. 3pp., 12mo. Regarding a drawing titled 'The little Chest', which 'Mr Macquarie' would like Slocombe to being at once. With postscript signed 'S. L.' THREE: 4 June 1904. 2pp., 12mo. He was 'on the point of writing', to ask when he could 'buy those delectable pipes', when Slocombe's 'most acceptable present' arrived. He ends by asking to be reminded to send him a 'soiree ticket'. FOUR: 1p., 12mo. [ Seymour Aubrey Papert, MIT mathematician and computer scientist. ] Typed scientific paper in French: 'Sur les treillis des ouverts et les paratopologies | par Mrs Dona Papert et Seymour Papert'. Papert has been described by by Marvin Minsky as 'the greatest living mathematics educator'. At the time of this paper he was studying for a PhD at Cambridge University and living in London, where he was a leading figure in the revolutionary socialist circle centred on the magazine 'Socialist Review'. 9pp., 8vo. On nine leaves stapled together. In fair condition, aged and worn, with creasing to last couple of leaves. Divided into three parts: '1. Propriétés des treillis des ouverts et représentation des treillis comme treillis d'ouverts; | 2. On letterhead of Georgian House, Bury Street, St James', SW [London]. 12 January 1914. 1p., 12mo. On thick deckled-edge paper. He apologises for the delay in sending a copy of his 'Iron Pirate', due to a delay in receiving it from the publishers. 1p., 8vo. On yellow paper. On lightly-aged paper, with slight wear and creasing along one edge, and thin stub from previous mounting adhering to the reverse. 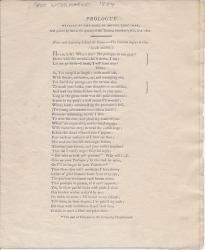 The poem is twenty lines long, arranged in five stanzas, and signed at the foot 'George Steele Seymour'. 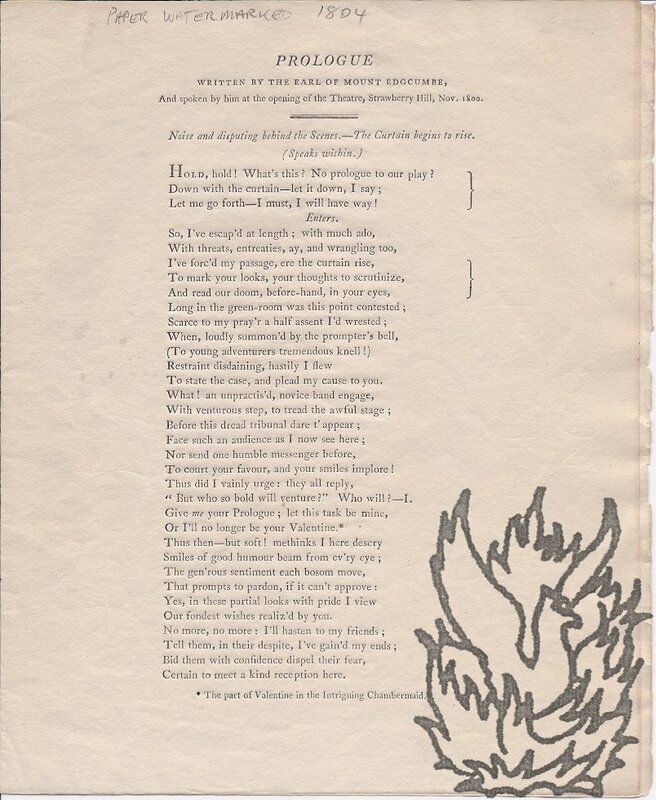 Beneath this, in Seymour's hand: 'Special greetings to Mrs.
Autograph Card Signed ('R Bridges') from the Poet Laureate Robert Bridges to the Rev. P. O'Toole. 18 Merton Street, Oxford. Postmarked 18 April 1917. Manuscript 'Licence for Elizabeth Adams to Lett to Robert Adams' premises in Longhoughton, Northumberland, signed by Hugh Percy, Earl (later Duke) of Northumberland, and his wife ('Northumberland' and 'Elizabeth Northumberland'). Folio, 1 p. Bifolium. Text on recto of first leaf; docketed on reverse of second leaf. Text clear and complete. Fair, on lightly-aged and worn paper. Headed 'Longhoughton | Northumberland'. Signed at foot by the Earl and Countess. Begins 'Licence is hereby Granted to Elizabeth Adams to Lett Lett or Assign over to Robert Adams All That Messuage or Tenement and the Lands thereto belonging with the Appurtenances Lying and being in Longhoughton held of us by Lease for Twenty One yeares from Ladyday One thousand Seven hundred forty and Nine'. Autograph Letter Signed from the bluestocking sculptor and author Anne Seymour Damer to an unnamed male correspondent, concerning a 'favourite old Clock;'. 1 April 1824; Upper Brook Street. 12mo, 3 pp. Bifolium. 28 lines. Text clear and complete. Good, on lightly-aged paper, with a trace of the mount adhering to the reverse of the second leaf, which is docketed by the recipient. The letter concerns her 'favourite old Clock', about which she expresses anxiety: 'the Man you now send to wind up the Clock is, I dare say, very clever in his Business, but as he almost constantly leaves it with somethig not right in Motion, striking &c I must therefore think that he is not accustomed to direct all the movements of such a Clock'. Handbill headed 'Funeral Reform Conference. July 23, 1884. The Earl of Shaftesbury, K.G., Presiding. ', reporting Haden's views on 'the desirablilty of greater simplicity in the conduct of funerals'. 12mo, 2 pp. Good, on lightly-aged paper, with one dog-eared corner. Quoting Haden's views, which appear distinctly progressive. He finds the 'retention in a dwelling-house for as long as possible of a body, which ought to be committed to the earth as soon as possible', and the need for a 'strong coffin' great evils. 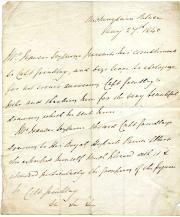 Autograph Letter Signed ('Jane Halliday') to an unnamed Lord of the Admiralty. Grove Cottage near Cowes'. Undated, but docketed '22 Sept: 1800'. 4to, 1 p, 12 lines. Very good, on aged paper. 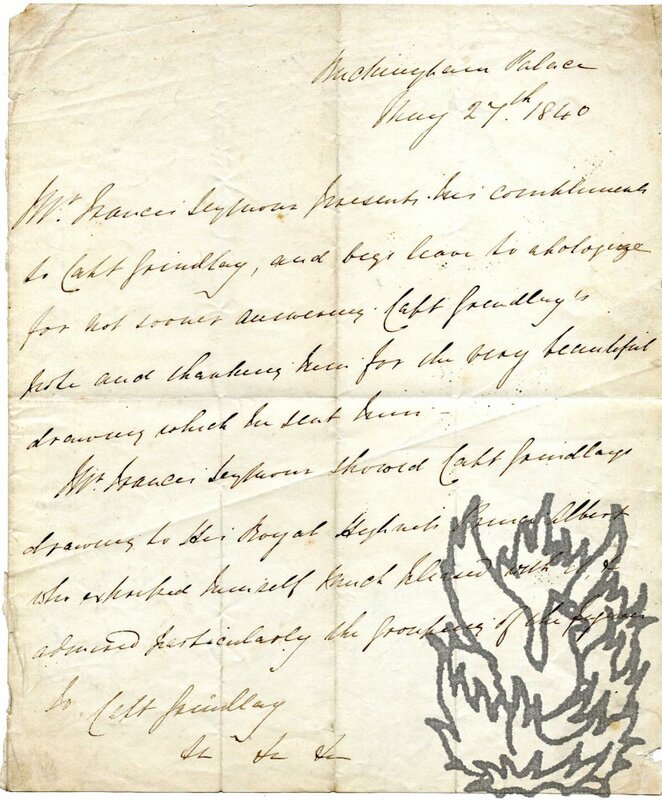 Asking the recipient 'through this medium to recommend my son Lieut Halliday [Francis Halliday, born around 1776; fl. 1820] of the Thunderer, now at Jamaica, to the notice of Lord Hugh Seymour; Sir Hyde Parker has sent me an account of him, but to my great disappointment has not brought him Home - - - - - Francis has been six years in the East & West Indies & very attentive to his profession'. She feels sure that 'a line from yr. Lordship to Lord Hugh could not fail of being of great use to him'. Docketed on reverse 'Mem: Enquire abt. 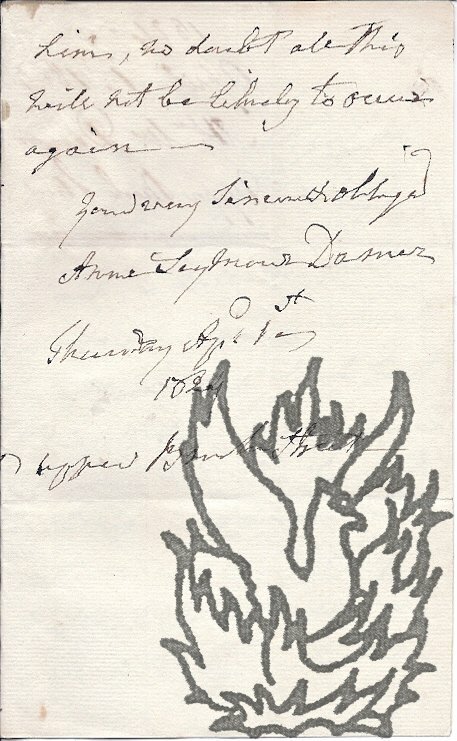 Autograph Letter Signed ('Jas: Stanley:Little') to S[eymour C.] J. Freeman-Matthews [of Cape Town]. 28 September 1900; on letterhead 18 Drakenfield Road, Tooting Common, S.W. One page, quarto. On aged and lightly creased paper. He is sending the signature with 'one or two others'. 'Possibly the work I have done for South Africa (I have been upholding the Imperial cause for a quarter of a century) is your reason for paying me the compliment.' Thinks he recognises from Freeman-Matthews' crest that he is 'a descendant of the Llandaff Mathews family'.